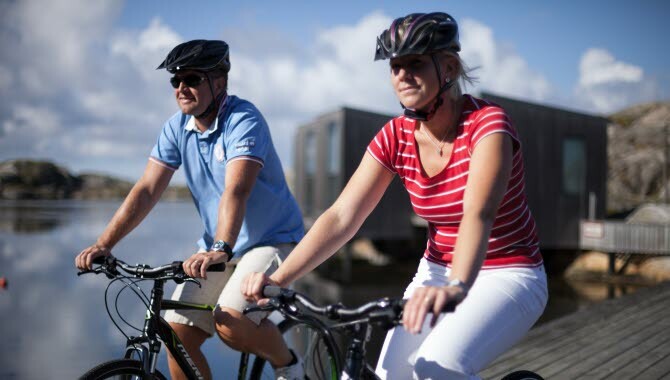 If you’re interested in experiencing West Sweden on a bicycle, there are lots of options – everything from island-hopping in the Bohuslän Archipelago to a relaxing ride along the Göta Canal. You’ll find lots of scenic bike routes winding through a diversity of landscapes: vast forests, open fields, lakes and the sea. 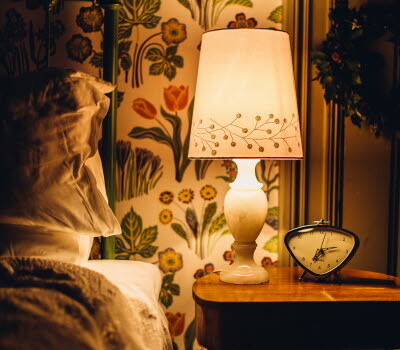 And you can add a touch of luxury, with fine accommodation and cuisine. A bike trip in the Bohuslän Archipelago is an experience that attracts cyclists from local towns and faraway countries. Here there are a number of day trips close to the coast. The combination of shorter sections of up to 20 or 30 kilometres, relaxing boat trips between the islands and great places to stop makes coastal cycling a brilliant option. Heading north from the centre of Gothenburg, you soon reach the Bohuslän coast. 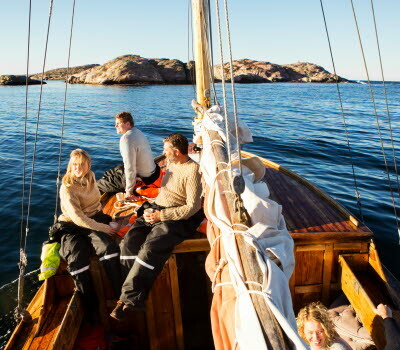 Or you can take a boat from Saltholmen in Gothenburg out to the islands of the southern archipelago. Here the island of Brännö is perfect for exploring on a bike. There are a number of biking packages that combine pleasant routes with good accommodation, each with its own special character. 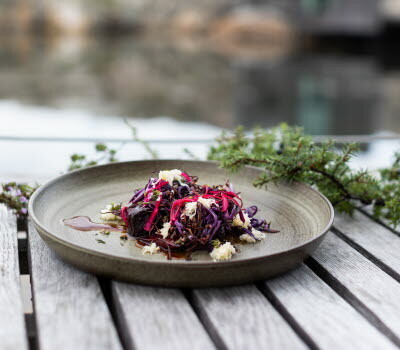 A good example is the package from Salt & Sill, where you stay at Sweden’s first floating hotel, with the renowned Nordic Watercolour Museum in Skärhamn just a quick ride away. Or why not pedal over to Klädesholmen, “the island of herring”. A real gem that deserves more attention is the group of islands on the eastern side of Orust island. The weather is calmer than on the west side, and it’s ideal for cycling. You can take a boat from Slussen on Orust to Lyckorna near Ljungskile. 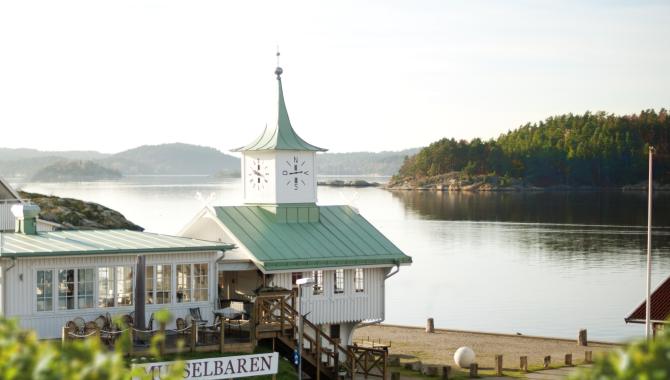 At Lyckorna don’t miss Musselbaren – a mussel bar – and Villa Sjötorp. From there it’s a pretty ride up the coast to Uddevalla. 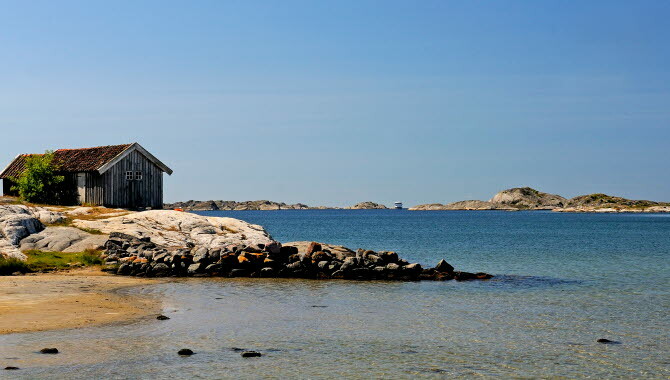 A bit further north we recommend the many beautiful areas around Lysekil. Here you can take a guided bike tour through the Skaftö beech forest or the Stångehuvud nature reserve. Around Fjällbacka you can ride in the footprints of actor Ingrid Bergman, and see locations from the crime stories of Camilla Läckberg, who grew up here. The rock carvings at Tanum, a UNESCO World Heritage Site located just to the north, are an absolute must-see. Another stunning destination is the Koster Islands, with quaint unpaved roads through sheep pastures, gorgeous sculptured granite coastlines, views across the open sea and Kosterhavet – a marine national park. And when you’re near the sea, watch for seals and porpoises. Between the towns of Falköping and Falkenberg, the Ätradalsleden (the Ätra valley route) winds through highly diverse countryside. You’ll find open meadowland, vast forests, lakes, rivers and streams. It’s a brilliant biking experience, with natural beauty all around you. The route is just under 200 km long, with 150 km on a railway embankment and the rest on scenic small country roads. In Falkenberg it connects to the Kattegat bike route. There is some unusual accommodation along the route, for instance on farms or in picturesque waterfront cabins. 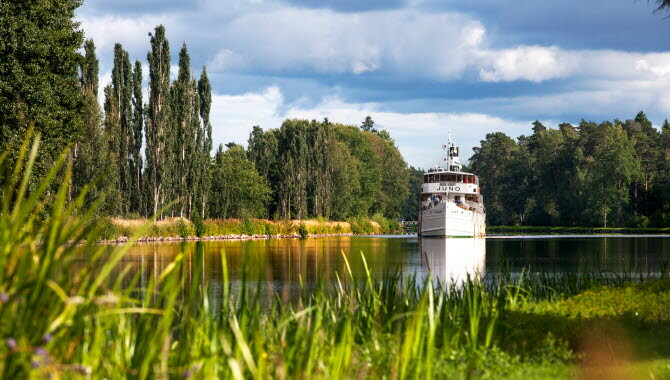 With over 1,000 lakes, dense forests, huge biodiversity and flower-lined roads, the Sjuhärad Circular Bike Trail offers beautiful surroundings for you to experience at your own pace. It’s about 150 km long, about 120 km of which is car-free. And it’s not a strenuous ride, as it mainly runs along an old railway embankment. A brilliant way to see the Göta Canal is to pedal along the car-free towpath that runs alongside it. The towpath takes you past the action at the locks and all the boats making their way along the canal. A good place to start is Sjötorp, where you can hire bicycles and get lots of information on cycling. You can also book accommodation at suitable riding distances along the canal. Dalsland also offers scenic, and sometimes more challenging cycling. It’s something of a mecca for mountain biking – although regular city bikes are fine if they have fatter tyres. Unlike many other areas, here you can ride on all the hiking trails. But please do so with respect for nature, animals and other people. 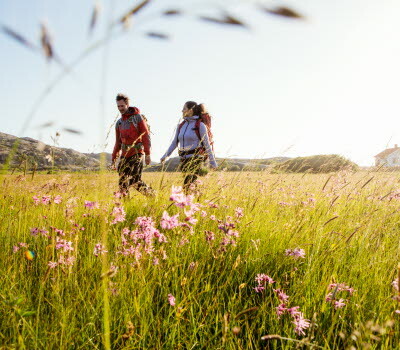 If you encounter hikers, stop and let them pass. Whether it’s an easy ride along the Dalsland Canal or the more difficult singletracks through the Dalsland wilderness, a mountain bike is the best option. While you’re here, take a canoe or boat tour on the Canal and experience the locks. Baldersnäs Herrgård is a manor house with great food and accommodation. AtDalslands Aktiviteter you can try a wide range of fun and challenging activities. The 360-kilometre Dalsland Trail passes through amazing countryside, including Tresticklan National Park and the Kroppefjäll plateau. 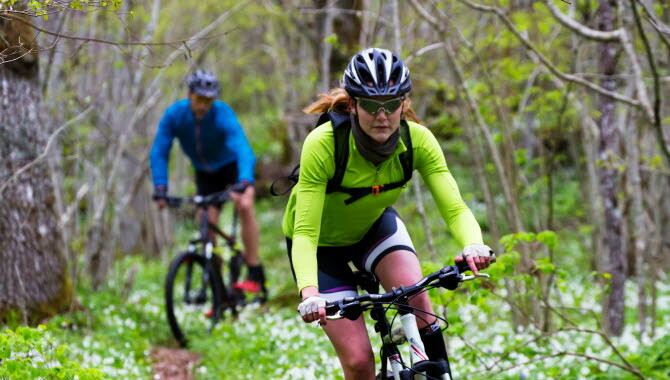 If you feel like testing your mountain-biking skills against other riders, or just against yourself, the 60-km Dalsland X-Country is a fun competition with a course that suits competitive as well as hobby riders. 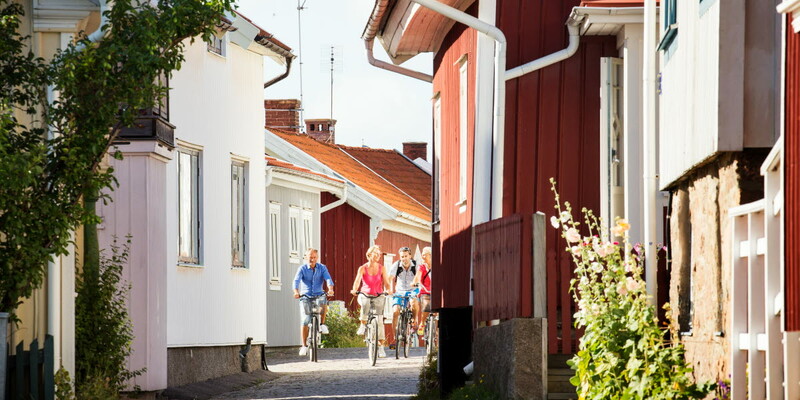 West Sweden is an obvious choice for your cycling holiday. If you don’t bring your own bicycle there are a number of rental businesses, guided tours and bike packages, some of which also include accommodation. Bring plenty of water – on some routes it can be 10 or 20 km between water taps. Remember that you travel quickly on a bike, and walking the same distance back will take a long time. So take a puncture repair kit. Wear a helmet – of course. Dress according to the weather. Remember, the weather is changeable here, so a small backpack with rainwear and other useful items is a good idea. Wear glasses. Getting a mosquito in your eye is painful. For a pleasant trip, buy a pair of bicycle shorts with a padded seat.